Why not hop across the border and visit one of Germany’s most beautiful places? Hike one of the highest areas in Germany, visit its third deepest lake and see its tallest waterfall. You won’t be disappointed! If you are staying at Viehhofen and fancy a day out with a difference, why not cross over from Austria to Germany and visit the national park that is located on the border? It is an easy enough trip from the site, just drive straight up the B311 for an hour, but remember to take your passport with you. The Berchtesgaden National Park was established in 1978 for the protection of the Berchtesgaden Alps, which are a mountain range that is part of the Northern Limestone Alps and runs through southern Germany and northern Austria. The mountain range is a wonderfully picturesque highland area with sub-alpine forests and incredible views. It is relatively untouched by human activity which makes it a peaceful environment. One of its highest areas is the massif of Watzmann which is the third highest mountain massif in Germany at 8,901 ft.
At the heart of the National Park is the large natural alpine lake, Königssee, which is certainly worth a visit for its huge expanse of crystal clear water. Gouged by glacial movements during the last ice age, the stunning lake is narrow but long at more than four miles in length. It has a distinctive fjord-like feel to it, surrounded as it is by steeply rising mountain flanks. This formation gives the lake excellent natural acoustics and it has become a bit of a tradition on boat tours to play a trumpet from the centre of the lake to demonstrate the echo that bounces back off the surrounding mountain walls. When the trumpet player plays along to the reverberating notes it can sound like as many as seven people are playing at once! Due to the remarkable water clarity, activity on the lake is limited to electric-powered passenger boats, rowing and pedal boats. But it is worth seeing the area from the water. You can find a timetable for the boat tours, as well as information on the landing stages and ticket prices here. This beauty spot is popular with hikers, and the church of St. Bartholomä is a famous pilgrimage church that is located on a little peninsula towards the centre of the lake. It can only be reached by boat as there is no lakeside path on the western shore. 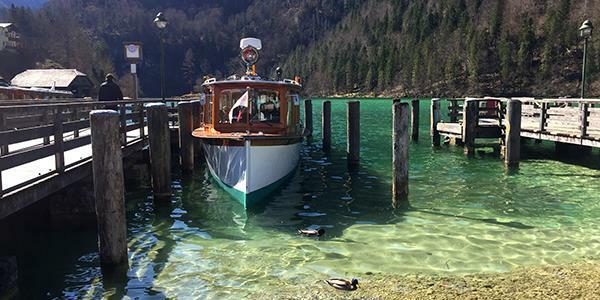 If you cross the Königssee to the Salet stop at its southern shore, you can hike up to the nearby, smaller lake Obersee. It’s here that you’ll be able to view the highest waterfall in Germany – The Röthbach Waterfall. The whole area is a really magical place and both lakes have an otherworldly feel about them. 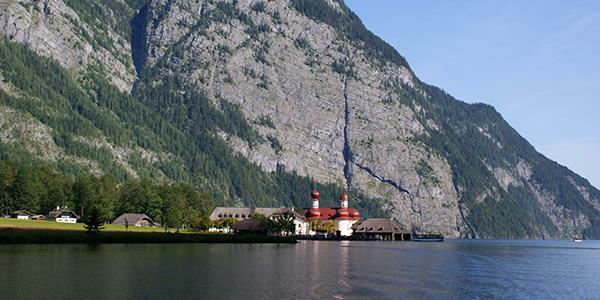 The Berchtesgaden National Park is now protected by UNESCO as a biosphere and is the only one of its type in Germany. If you fancy a day trip with a difference it is certainly worth a visit.